Technicians prepare the solar-powered, remotely piloted craft for test flight. 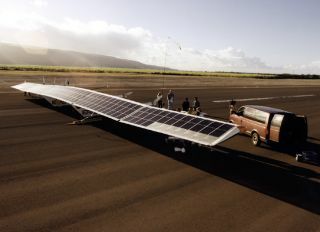 In this historical photo from the U.S. space agency, technicians make final adjustments on the solar-powered Pathfinder remotely piloted research aircraft prior to the craft's taking off on a flight which established a new unofficial world's altitude record for both propeller-driven and solar-powered aircraft. The new record of more than 71,500 feet was set during a 14 1/2-hour flight July 7, 1997, from the U.S. Navy's Pacific Missile Range Facility (PMRF) at Barking Sands, Kauai, Hawaii. The new altitude record is subject to verification by the National Aeronautics Association. The Pathfinder took off at 8:34 a.m. HDT, passed its previous record altitude of 67,350 feet about 2:45 p.m., and then reached its new mark at about 4 p.m. Controllers on the ground then initiated a slow decent, and Pathfinder landed seven hours later at 11:05 p.m. HDT.